Life was pretty good for the Onishi family living in Alameda, California in 1941. Though still both Japanese citizens, father Kenji Onishi had his own successful music store, and mama Aiko looked after the family, while sons Frank and Jeff and daughter Meri, short for America in homage to her parents adopted country, were all in high school. But the bombing of Pearl Harbor on December 7, 1941 changed everything. And it didn't take long for friends to become enemies or for attacks on people of Japanese descent to begin. Then, in March 1942, a curfew was ordered for all newly designated enemy aliens and Japanese Americans. A month later, notices were posted that they were all being evacuated, "for their own protection." Before the Onishi's knew it, they were living in a converted stable at Tanforan Racetrack, where there was no privacy, including in the shared lavatories. At each new humiliating discovery, Meri became more depressed and withdrawn, losing herself in the books sent to the internees by the Quakers. Not even meeting Brian, a friendly boy about her age, helps pull her out of her depression. 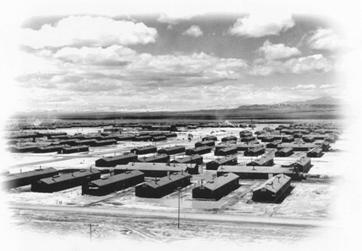 No sooner are the families in Tanforan settled when they learn they will be sent to another camp, this time to the Topaz Internment Camp in Utah. This is their home for the next few years. For a while, Meri's depression begins to lift when she begins dating Brian. Then when the government decides that Japanese-Americans can enlist , Jeff Onishi joins the army as soon as he is able, though his brother Frank vows he will never fight for the country that could treat its citizens as deplorably as the US is treating the Japanese. Meri cannot seem to accept what has happened without anger and resentment and no matter how hard Brian and others try to convince her that she can choose not to let circumstances ruin her life, they always do. But, when Brian tells Meri he also plans on enlisting, it is a decision that impacts their relationship and puts Meri's well being in serious jeopardy. AS Meri falls deeper and deeper into the depths of depression, can her mother be the strength she needs, despite Aiko's own losses and disappointments? 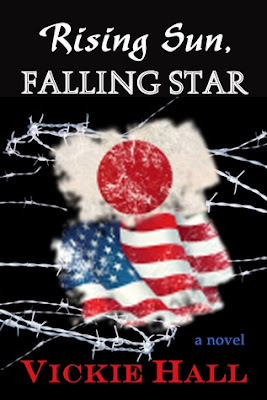 Rising Sun, Falling Star is a fictional family saga based on what really happened to the Japanese and Japanese Americans after the United States entered World War II. This well written, well researched novel realistically depicts the innocent, though gut-wrenching idea so many had that if they could just do something, anything to prove their loyalty to America, everything would be OK. Hall also gives us a clear picture of life in the internment camps, the deprivations, the humiliations but also the ways in which people managed to cope and even thrive. For instance, many skilled and talented people were interned, and they provided opportunities for others to learn different skills and help relive the oppressive circumstances under which they lived. The art class that Brian and Meri take while at Topaz is similar to those offered by artist Chiura Obata when he was interned there. The story of the Onishi family, their ups and downs, their triumphs and defeats, their wins and losses is rendered beautify by Hall and is a family story that will stay with you for a long, long time. Ah, would pair well with WEEDFLOWER by Cynthia Kadohata and DEAR MISS BREED by Joanne Oppenheim. I do want to read this. Yes, this would pair well with both of those books. The more I get into the Common Core, the more I begin to see this kinds of pairings. I think you would like this book, Joyce. Thanks for sharing your post. Sounds like a good book. Your welcome, Eva. It is a really interesting book. Thanks for this review! It sounds like this book would make a good addition to my blog. I just reviewed Barbed Wired Baseball a couple of weeks ago. I've also read A Diamond in the Desert, but I read it before I started the blog. I'm interested that all these books about the internment camps are coming out now. I wonder why? Thanks for stopping by. Yes, I think this would be a nice addition to your blog. Books about the internment of Japanese people during WW2 are very interesting and all so unique. I also found Barbed Wire Baseball to be fascinating. Perhaps the idea of being held for no reason and losing everything you ever worked for accounts for your interest. This sounds like a very powerful book and I am sure it will break my heart. I just read two other books about the Japanese camps during WWII and both made me feel so bad for the people that had to live in them. While both books focused heavily on the camps, neither was told from someone in the camp, so the information was secondhand. I am definitely curious to read this one. Thanks for sharing!